The Traditional Music Ensemble, a.k.a. 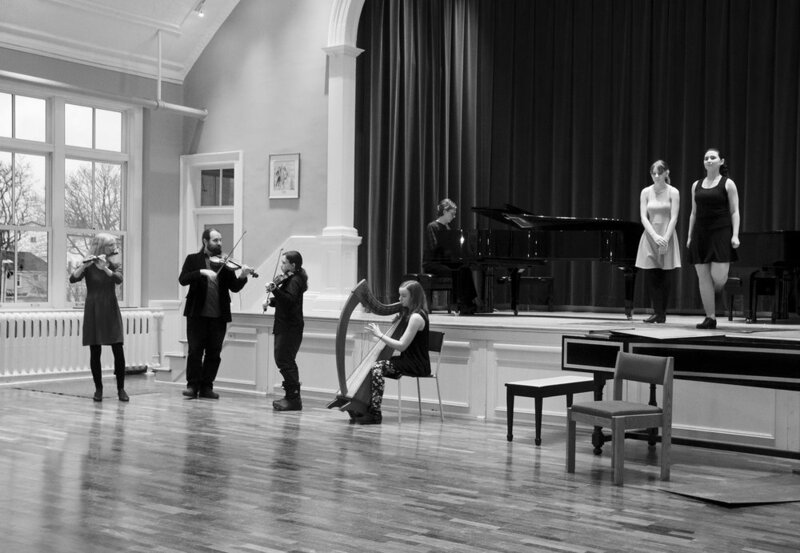 the "Trad Ensemble" or "Trad Class" at the Maritime Conservatory of Performing Arts, offers instrumentalists from age 13 to adult the opportunity to learn a wide variety of tunes from various cultures. We engage in session playing and take favourite tunes to the stage as a trad band, building aural and arranging skills along the way. I launched this ensemble in 2015 and in 2018 Anthony Rissesco joined me as co-director and in-house fiddle coach. The class also features many guest instructors from the Halifax trad scene. This has included Wendy MacIsaac (Cape Breton), Gina Burgess (klezmer), Anthony Rissesco (Irish, Old time, etc. 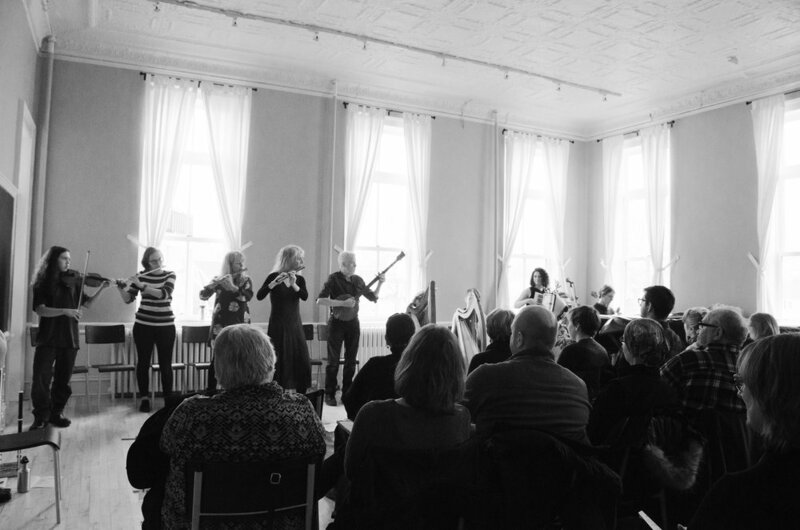 ), Cathy Ann MacPhee (Gaelic song), Kirsty Money (Swedish nyckelharpa), Adrianne Greenbaum (klezmer), Jeremy Finney (Irish), Ellen Gibling and Alys Howe (harp), Saeed Foroughi (Persian), Darren McMullen (of Còig), Cathy Ann MacPhee and more. We made a music video in collaboration with the Vivid Vocal Ensemble in Nov. 2017 for the CBC Music Class Challenge, a cover of Joni Mitchell’s “Both Sides Now”. 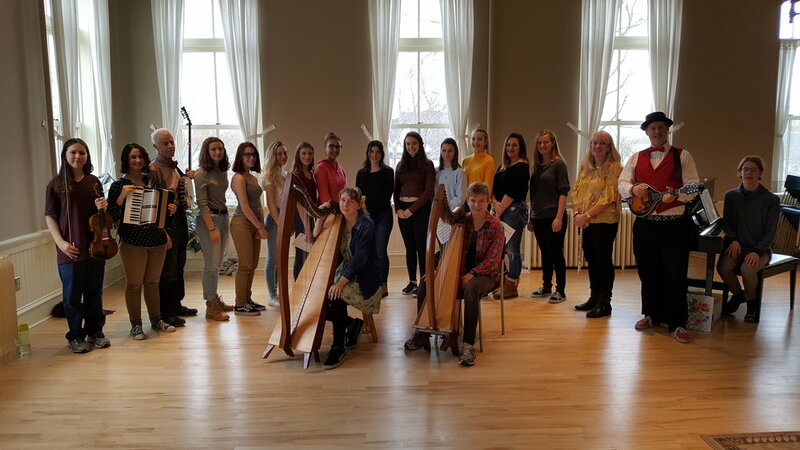 We hosted exciting open workshops with Kevin Crawford and Lewis MacKinnon in the winter of 2018 and staged a full-length fundraising concert in March with Papilio. We also feature vocalists and dancers in many of our shows. We play at the Maritime Conservatory, the Halifax Central Library, the Halifax Public Gardens, the Re-Jigged Festival, Northwood Terrace, and other venues. Two of our members have been Boxwood Festival scholarship winners: Alistair Maksym (2017) and Piper Doak-O'Neil (2018). Oct. 20, 2018, 12noon: Our own “Tunes at Noon” performance and session at the Re-Jigged Festival in Dartmouth, NS. Oct. 21, 2018, 2:00pm: Played a klezmer set with Gina Burgess (of The Jerry Cans / Gypsophilia) and bassist Lukas Pearse in a concert of Jewish Music at the Maritime Conservatory. Nov. 18, 2018, 3:30pm: Performance in Senior General Recital at Maritime Conservatory. Feb. 3, 2019, 3:30: Performance in Senior General Recital at Maritime Conservatory. Feb. 17, 2019, 2pm: Performance at the Halifax Central Library as part of Maritime Conservatory outreach concert. The Trad Ensemble, with Gina Burgess and Lukas Pearse, just ahead of presenting our klezmer tunes in a lovely concert of Jewish music in front of a full house at the Maritime Conservatory, Oct. 21, 2018. What a band, and what a blast it was for our students. Apr. 7, 2:00pm: Maritime Conservatory spring senior general recital performance. Apr. 14, 1:30pm: Regular class. Apr. 28, 1:30pm: Class with guest instructor Kirsty Money and her nyckelharpa petting zoo. May 5, 1:30pm: Class with guest instructor Chris Norman, simple system flute and director of the Boxwood Festival. May 12, 1:30pm: Class with guest instructor Gina Burgess on Klezmer music. May 19, 1:30pm: Regular class. Sat. May 25, 6:00pm: Birks Ensemble Concert at the Maritime Conservatory. There may also be a late afternoon rehearsal as well. May 26, 1:30pm: Regular class. June 2, afternoon: Regular class time start at 1:30, with extra dress rehearsal time afterwards. June 2, 7:30pm: Joint full concert with Maritime Conservatory Baroque Chamber Ensembles in Lillian Piercy Concert Hall, Maritime Conservatory. Donations at the door are most welcome and will be used to help younger ensemble members afford to attend the Boxwood Festival. Call time for musicians: 7pm. It was a pleasure to perform as an ensemble and teach some Swedish tunes at our own lunchtime trad community event on Oct. 20, 2018 during this festival. The Traditional Music Ensemble collaborated with the MCPA Vivid Vocal Ensemble in Nov. 2017 to make a CBC Music Class Challenge video cover of Joni Mitchell's classic song "Both Sides Now". Here is the video link. Open Irish tune workshop with the legendary Kevin Crawford of Lúnasa, Jan. 2018.